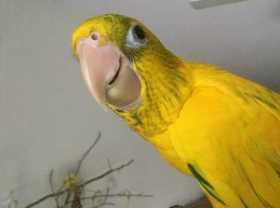 Our beloved Golden Conure flew off on Thursday, March 21st in the afternoon and is believed to have been heading East on Community Ave in NW Port Charlotte. She is only 6 months old and completely friendly, she may respond to her name, Seraph. She has some black spots on her beak not in the pic.